What are you doing about game ROM's? 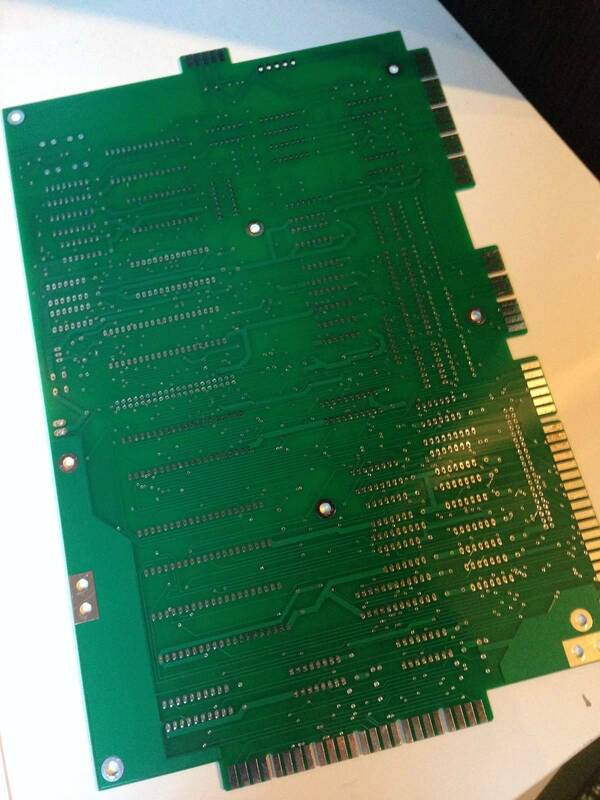 The board uses your original roms, or you can buy a fresh set from the copyright owners to use. 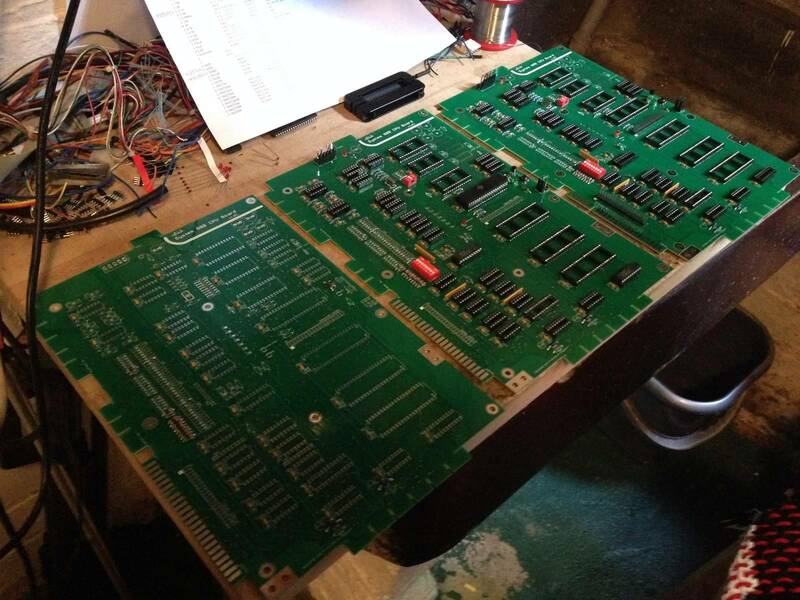 Back from the UK Pinball Party (this weekend just gone) and now assembling boards. 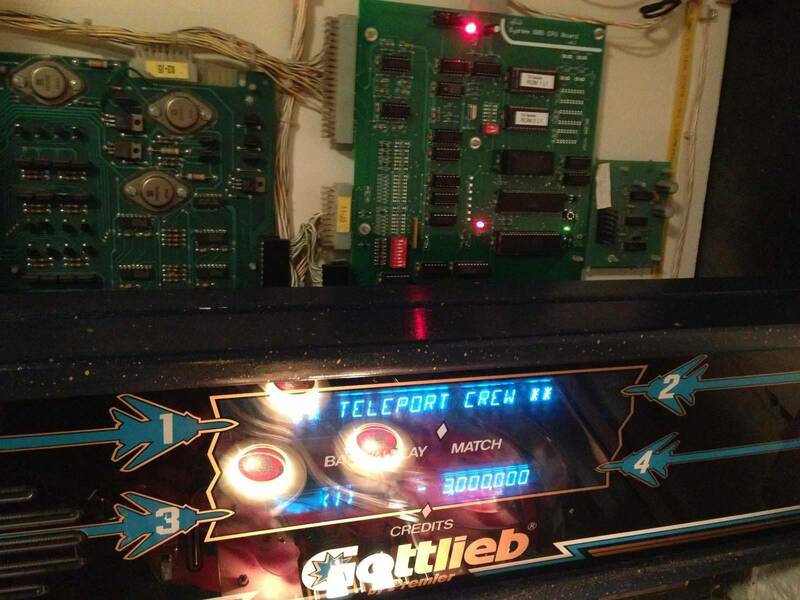 This one is destined for The Goonies Pinball Project. 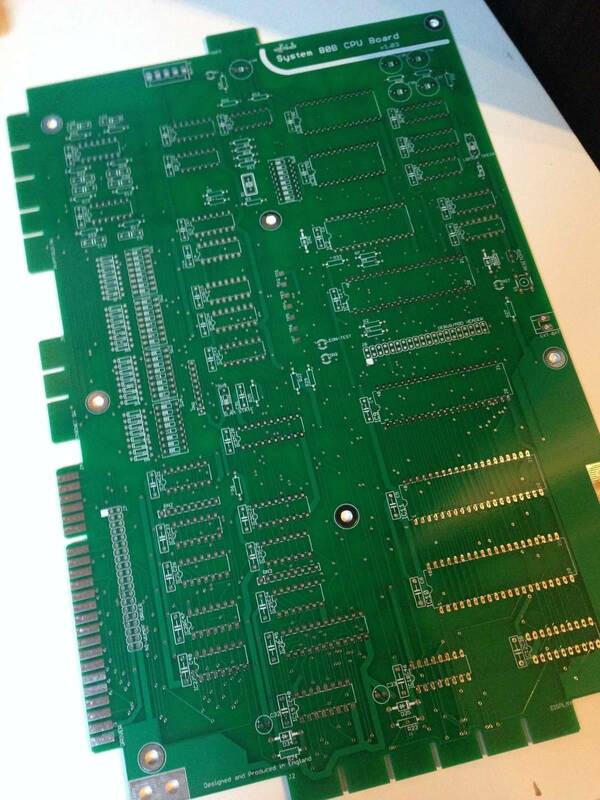 I'm not sure if this was asked before, do you sell just the board and parts? 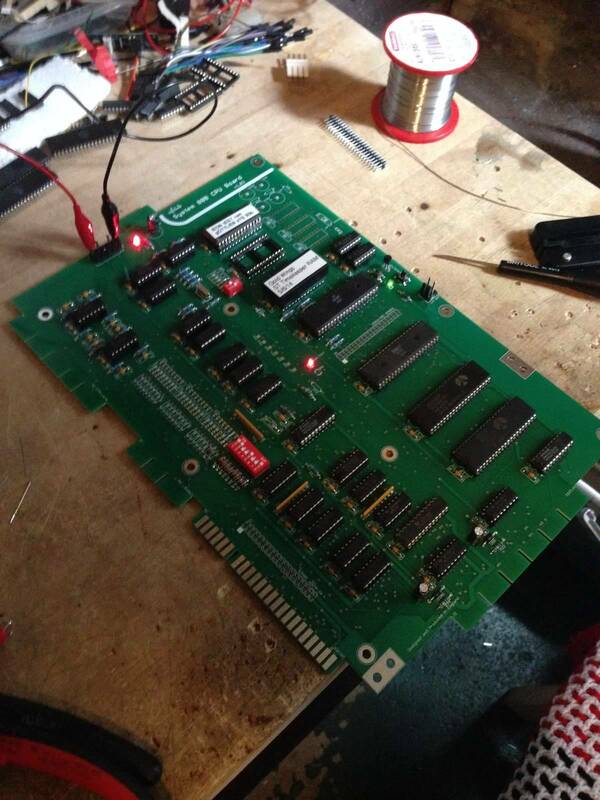 I'd love to solder one up on my own. 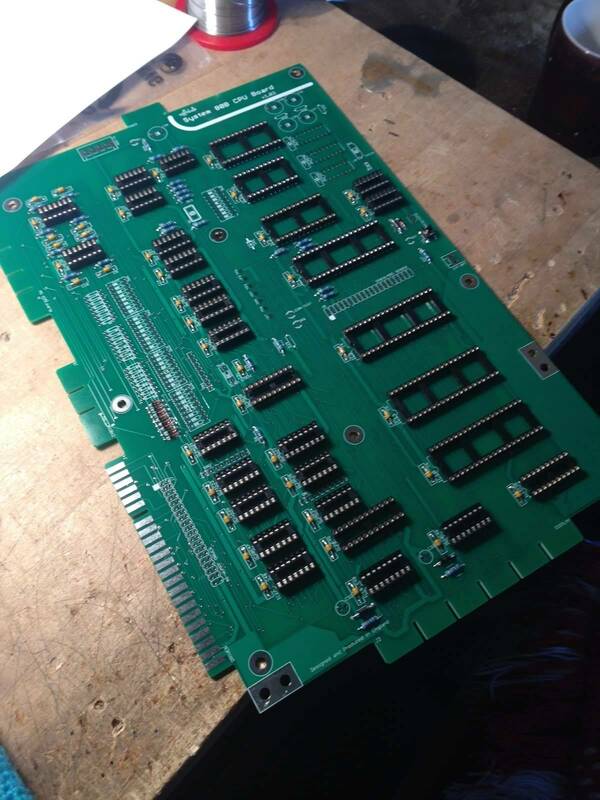 Or even just the bare board, with a parts list? 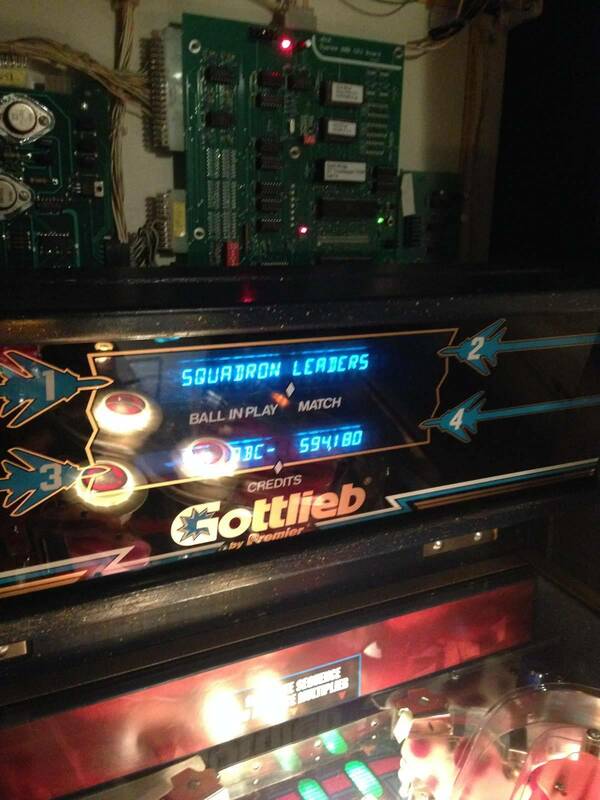 our tastes in pinball are so similar it is kind of creepy!!! 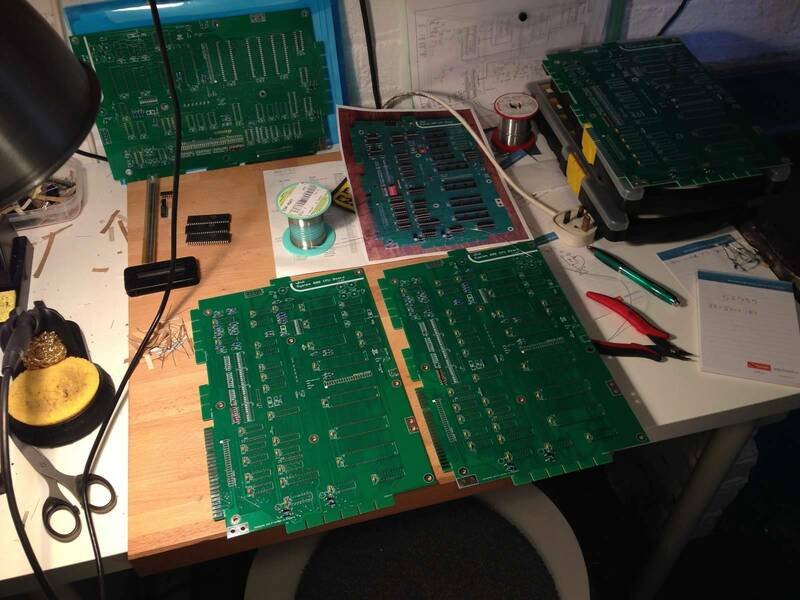 Yes you can buy a full kit or just the bare board if you'd like. 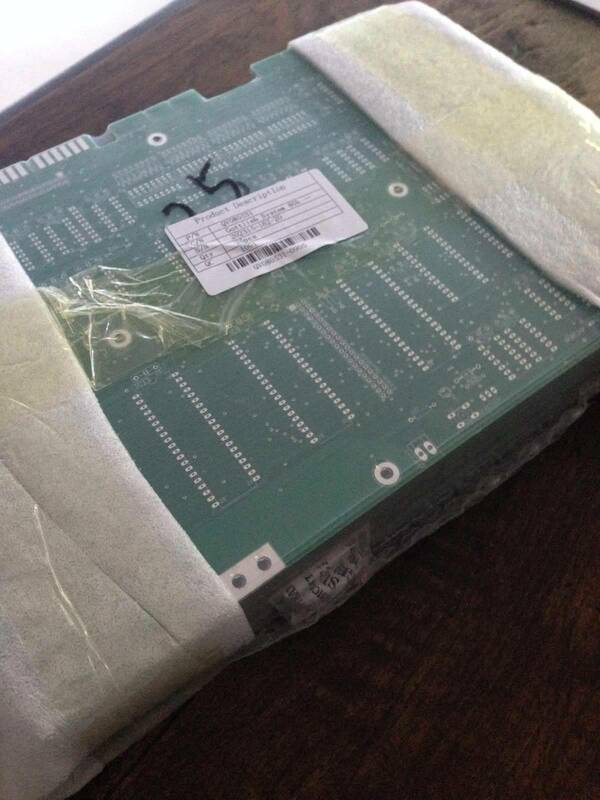 I have a BOM (Bill of Materials) that i can supply. Contact me directly with your email address. Thanks so much for the little extra love on this. The custom text for the display will be the icing on the cake for my project. Looks great. Respect for your achievements and putting so much effort in this! Just a quick update for people wanting the blank board to assemble themselves. A little autumn/winter project maybe. I have a full Bill of Materials with all part numbers for element 14/farnells. I am also happy to guide you through how best to assemble them. The cost here would be £60 plus £7.50 shipping standard or £15 shipping tracked to USA. I can work out a US dollar price to if that works better for anyone. (I am in the uk ) Payment is via paypal. Buy with confidence from Jim. Shipping actually does not take long to the US. Thanks for the work you did to help out a lot of games. That's a beautiful thing right there. Thanks! Gold Wings is fine choice! I love mine, which is what started this whole project! Got mine in today. Thanks Jim! 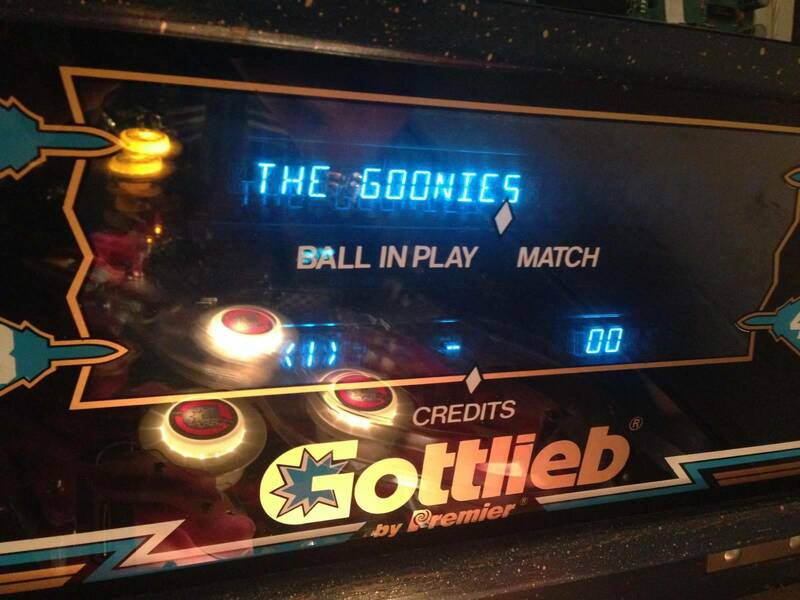 Goonies pinball will be coming to life very soon. 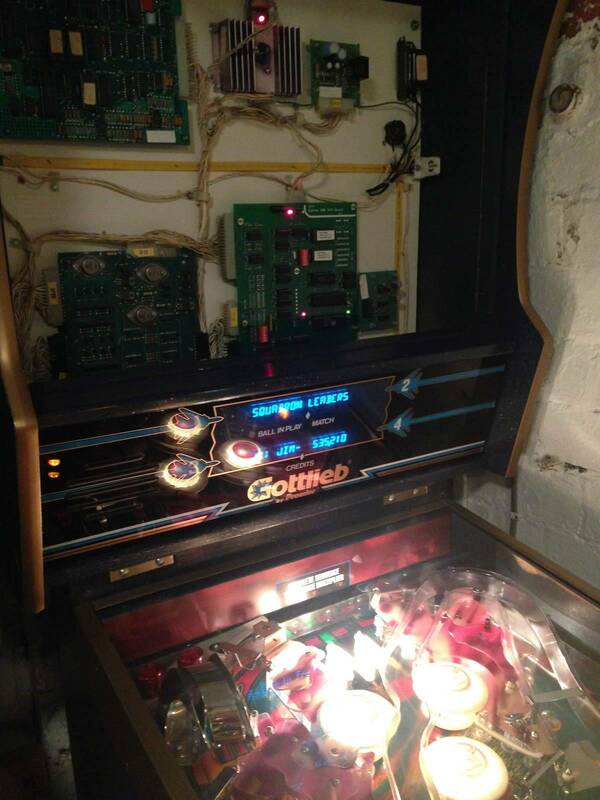 Goonies pinball has a pulse. 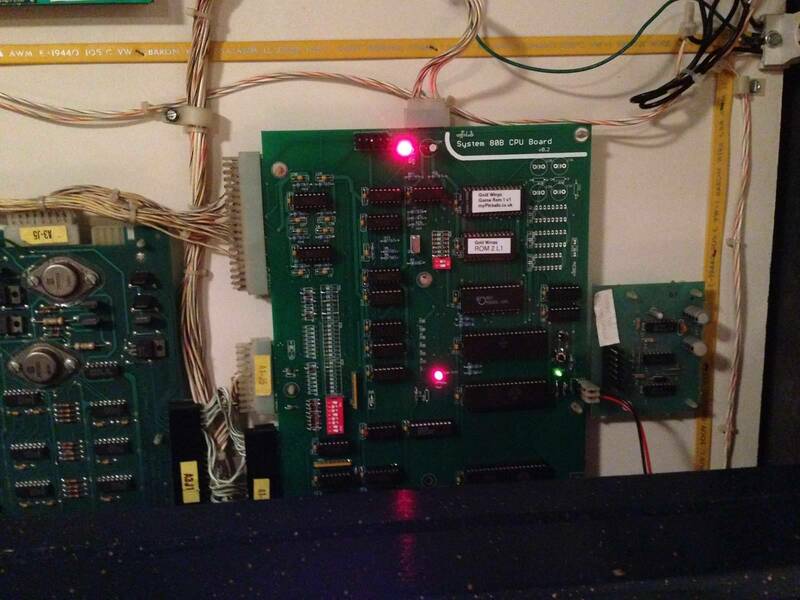 Power supply tuned in and the new 80B board installed with custom ROMs. Looks great Jim! Excellent Mike Goonies is alive! Didn't notice until now. There appears to be a header to replace the TC1 connector. 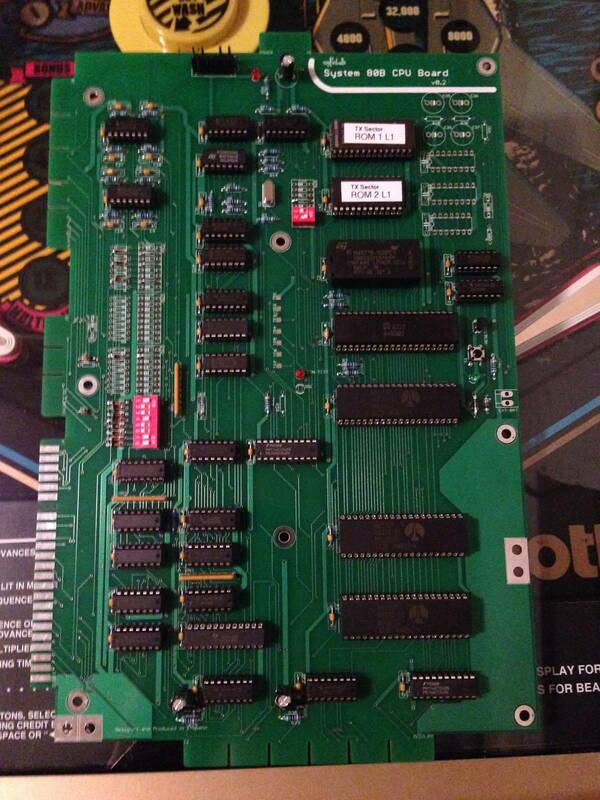 If so, did you remember to 'swap sides' on the pins so that it would work with any DIP adapter cable? 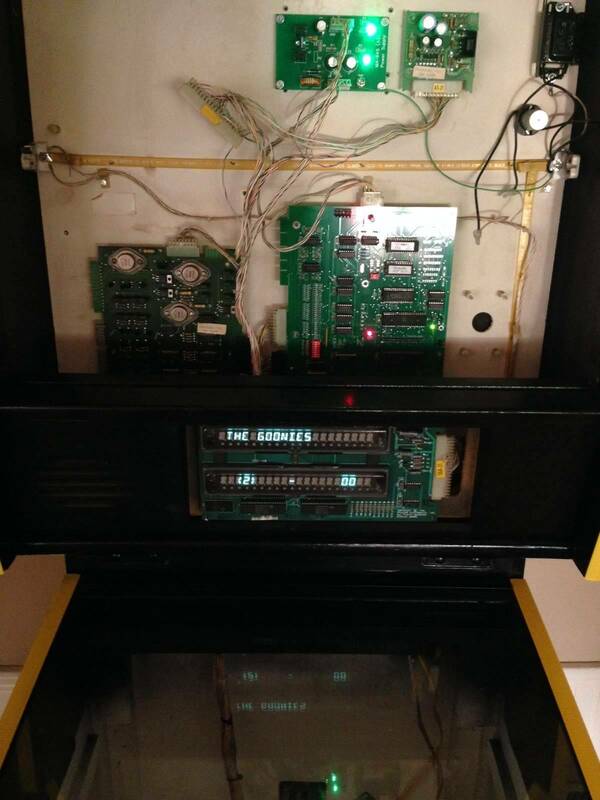 Or with a standard ribbon cable where the DIP connection was presumed? In converting from a dIP to a header, people often just tie pin 1 of header to signal that was pin 1 of DIP (DB7 for this board), pin 2 of header to signal that was pin 40 of DIP (AB4 for this board), etc. BUT - using an adapter (simple ribbon cable) does not follow conventional pin out and the left and right sides must be swapped. The result would be what was pin 1 of DIP (DB7) would be tied to pin 40 of DIP on the opposite end. DIP pin 1 would connect to opposite end header pin 2. 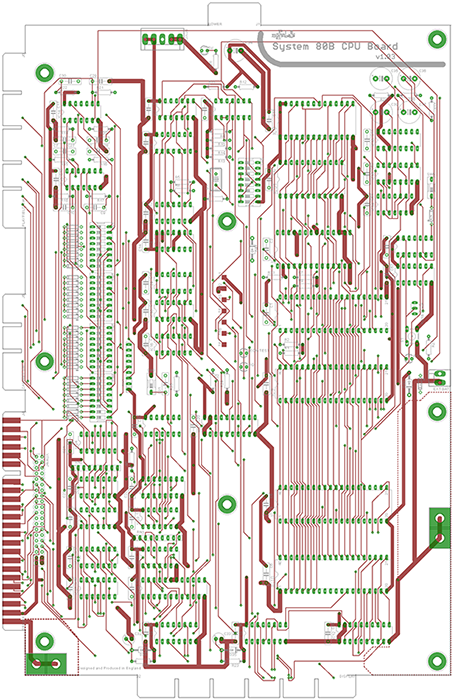 DIP pin 40 would connect to opposite end header pin 1. DIP pin 2 would connect to opposite end header pin 4. DIP pin 39 would connect to opposite end header pin 2. So pin 1 of header must be what was pin 40 of DIP (AB4) and pin 2 of header must be what was pin 1 of DIP (DB7). Lets say somebody used the TC1 connector with a cable that has a DIP plug on one end and 40 pin header (or DIP plug) on the other. If you then change this TC1 from a DIP connector to a header connector and that same person then tried to use this TC1 connector with a simple ribbon cable - it won't work The left and right sides would be reversed - you would be putting 5VDC down their reset line and vice-versa. I do include a header output on the board labelled 'Debug/Mod Header' which is an optional install. The premise for this is to add an option for future add ons or test cards that i may, or other people may build in the future. It is not meant as a direct replacement for the old TC1 header, but does include all the useful address, data and control signals you may need for such mods etc.